Effective January 1, 2018, Education First Federal Credit Union will be replacing all stolen or expired debit cards with EMV chip cards. What is an EMV chip card? Check out these FAQs to find out! What is an EMV or chip card? An EMV or chip card is a plastic debit or credit card that contains a microchip and also a magnetic strip. EMV stands for Europay, MasterCard, and Visa- the three companies who created the cards. 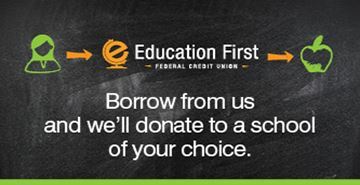 Why is Education First switching to EMV chip cards? We are switching to EMV chip cards to add additional security to combat card fraud during in-person transactions. Unlike magnetic strip cards, EMV chip cards include a microchip that cannot be duplicated. Plus, the EMV chip card is authenticated in each transaction, meaning the transaction will not go through if a fake or duplicated card is presented. How do the EMV chips work? EMV chips are microprocessors that contain dynamic data. This means that the data and authentication changes for each transaction and is not easily duplicated. When will I receive my EMV chip card? We have begun the process of replacing all debit cards with chip technology. If your card is lost or stolen, your new replacement card will receive a chip. How do I know I have an EMV chip card? Just check the front of your card and look for the gold square microchip. My new card has arrived, what do I do now? As with any new card, you will have to activate it before you can use it. Dial the 1-800 number listed on the sticker on the card to activate the card. What if my current credit card is linked to recurring and scheduled payments? Your new EMV chip card will have a new number on it so you will need to update your card number on any recurring, automatic or scheduled payments. How do I activate my new EMV chip card? EMV chip cards are activated the same as the magnetic strip cards. Simply contact us at (409) 898-3770 or dial the 1-800 number listed on the sticker on the card. How do I use my EMV chip card for purchases? If you are shopping at a merchant that has a chip-enabled terminal, insert your chip into the reader, approve the transaction amount, enter your pin or if using credit - sign when prompted, and then remove your card only when prompted. *Please note that if you remove your card before you are prompted, the transaction will be declined and you will need to restart the payment process. If your merchant does not have a chip-enabled terminal, simply swipe your card as you normally would. EMV cards do not impact online transactions. If you are shopping online, just enter your card number as normal. How do I use my EMV chip card at an ATM? At EMV enabled ATMs, you will be asked to first insert and then instantly withdraw your EMV chip card. Then, you will be asked to insert your EMV chip card again and leave it in the ATM for the duration of your transaction. Once you are finished at the ATM, be sure to remove your card! Since I have an EMV chip card, do I still need to inform Education First when I plan to travel internationally? Yes! Setting a travel notice on your credit and debit cards is always recommended, regardless of if it is a chip card or a magnetic strip card. Are there any additional fees with EMV chip cards that I should know about? No, simply use your card as you normally would and enjoy knowing that you are better protected against fraud. If you have any other questions, feel free to give us a call at 409.898.3770! We'd be happy to help!